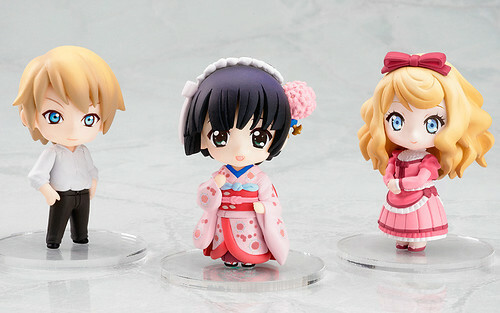 From the TV Anime title “Ikoku Meiro no Croisee” are Yune, Claude and Alice as a Nendoroid Petite set! As optional parts, Yune comes with a picture book given to her by Claude, Claude comes with his apron, and hammer parts, and for Alice, she comes with tea set parts! The Petit set will be priced at 2100 Yen and scheduled for late April 2012 release. This entry was posted in News and tagged alice blanche, claude claudel, ikoku meiro no croisee, nendoroid, petit, puchi, yune. Hopefully we might see another set at some point down the road. Agreed. This set is quite unique, compared to the other Petit set IMO.